Partner and Chair of IP Litigation, Benjamin T. Horton is featured in an article appearing in the inaugural issue of Emerging Lawyers Magazine – November Edition for 2016, profiling his path as one of the youngest partners at Marshall, Gerstein & Borun LLP. His work involves patent infringement and litigation, along with high stakes disputes. To view the profile, click here. Benjamin T. Horton manages complex litigation involving high tech patents. He has a degree in electrical engineering, and before law school he worked for technology companies in the automotive and semiconductor industries. He is a member of the Trial Bar for the Northern District of Illinois and litigates intellectual property cases in federal courts across the country. 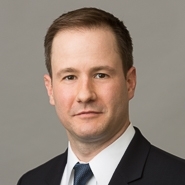 Mr. Horton also practices before the Patent Trial and Appeal Board, representing both petitioners and patent owners in inter partes review and covered business method review proceedings.